And here is the main ingredient starring in the penny test. You probably won't notice the different sizes when you bite them, but they are definitely varied. There are plenty of them and they taste just like regular Whoppers. So, let me explain what I meant earlier. 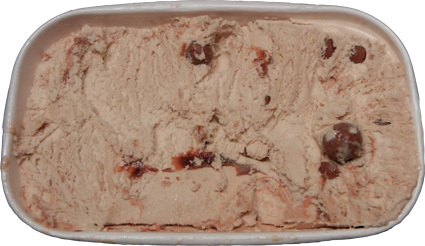 See, in a perfect world, this lower calorie dessert would be just as wonderful as Ciao Bella Malted Milk Ball Gelato. Problem is, we live in the real world and the Whoppers flavor here is just down right overpowering. 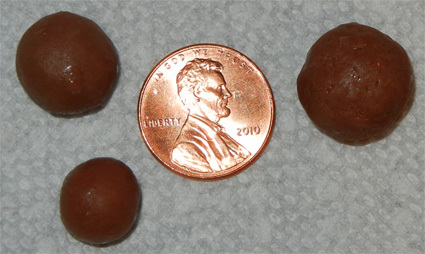 You'd think I'd be excited by mini-whoppers in every bite but I'm just not. I also got a chewy vibe from the base ice cream which also happens to be too flavorful. Usually I complain flavors are too mild, but this is just way too strong. Even the half eaten container has an overpowering whopper smell. Since my first experience wasn't that good, I decided to go with a milkshake for the second and third scoops. I didn't put in enough nesquik to mask the malt the first time, and the second time I put in too much. Sure, there is a little bit of fun scooping out the mini whoppers as you make your shake, but overall, it just doesn't hit the spot at all. This one is a fail for me. Dubba's note: I found the secret to this one... pawn it off on your kids! At least my daughter likes it! Try the tin roofed sundae blasts! SOO AMAZING!!!!!!!!!! Please try it! YOU WON'T REGRET IT! Oh shame you dont like this!! Dont think i would be a big fan either. 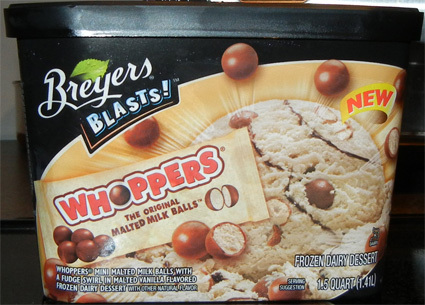 Just bought this stuff and it is the most disgusting ice cream that I have ever had and I love whoppers. It smells like green olives and you can't help but to smell it when you eat it.